I have been watching a bird in my feral flock for the past two days. Just didn't seem to look right and was unable to compete for seed with the rest of the flock. I tried a few times to catch him but he kept flying back up to the roof. Thismorning he did not come down from the roof with the rest of the birds for their morning feeding. I noticed him sitting alone on the roof all fluffed up. About an hour ago I spotted him on the ground in the corner, behind a palm tree, just sitting all fluffed up. He made no attempt to fly or run away. I easily picked him up and brought him inside. On first impression, he is unbelievably emaciated. I have had starving birds before, but this is the worst I have ever seen. Opened his beak and he is loaded with canker, from the roof of his mouth going down his throat. When I placed him on the kitchen counter he stood in the pengiun stance and was stretching his neck and gasping. 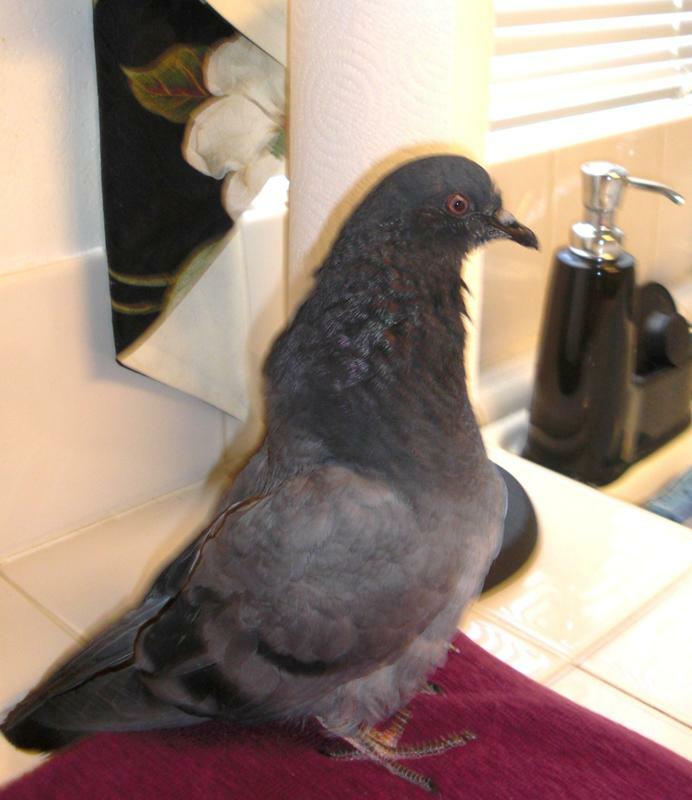 Although his vent area is clean, his tail feathers are caked with dried greyish poop. I have hydrated him with 2cc of warm water and then syringe fed him 2cc of baby applesauce. I then administered 50mg of Flagyl, cleaned his tail and have him set up on heat in the hospital cage. I will wait a few hours and then attempt to start hand feeding kaytee formula. This bird is very critical, he is just stitting fluffed with his eyes closed. I hope I have found this one before it's too late. The baby needs all the postive thoughts and prayers we can muster up. The battery for my camera is charging and I will send a picture to Charis and hopefully she will post it for me later. Bless you, Louise, for keeping a close eye on this little one, catching him and getting him situated and out of harm's way. It certainly sounds like you have a handle on this. Since this is a long weekend do you think it would be prudent for Dr. Hauck to take a look at him, that is if he is in and there is an opening? I'm 'mustering' up all my positive thoughts for you both. Best wishes for your patient, Louise! I hope he came to you in time! Like Cindy, I also think it would be good to have Dr. Hauk look at him. Considering the experience you've had with rescues, if you say this one is the most emaciated you've ever treated, it's possible that secondary infections have set in already (Salmonella is a posiibility, if his vent was caked) and probably he'll have worms too. Poor little thing! Thank you Cindy and Teresa. I tried getting into Dr. Hauck's, but his office closed early today for the long weekend. Fortunately I have just about every medicine I should need on hand to treat him for secondary infectons, worms ect. I started with just the Flagyl as I know the canker is the primary condition. He has pooped twice since I hydrated him.........just white urates, absolutely no solids. On the positive side at least they were not yellow or bloody poops. I just fed him 5cc of Kaytee.......hopefully he will keep that down. He has little to no strength left in him. We'll see how he handles the food and then I will increase the kaytee later on today. I sent picture to Charis. I'm sure she will post it when she returns home. What rotten luck Dr Hauck being away for a long weekend... but, as you said, the poops could be a lot worse, so with a bit of luck it might be little more than starvation, being unable to eat, maybe even drink, because of the canker. I would watch out for signs of dehydration and give him plenty of warm water with electrolytes. If he can keep the formula down, that will be a big bonus! I was afraid Dr. Hauck's office might close early because of the long weekend. It's great that you have meds on hand, Louise. He definitely has the 'penguin' position going on. Bless his heart. The good news is, he's been taken under your wing. Thank you Cindy and Teresa for all the kind words and beautiful pictures. I spoke with Charis and she suggested I get more formula into the bird as she is so weak and needs immediate nourishment to keep her alive. I have since fed her 10cc two times. She has held down her food and Thank God, her digestive system is working. She is pooping and solid poops are beginning to form. I will feed her altleast 2 more times thisevening and hopefully she will make it through the night. That little one is pretty thin. And such a little darling. Isn't it incredible how resilient these babies are? I'm hoping for the best, Louise. I hope you both had a restful night, Louise. She made it through the night. She seems slightly more alert thismorning He food is being digested and she is pooping mushy solid poops now. I have administered another 50mg of Flagyl and have increased her feeding to 20cc's at a time. Feeding her is a tedious procedure as it is so difficult for her to swallow. She can take only less than 1cc at a time. She is standing puffed up and only goes into the pengiun stance and neck stretching right after feeding......Poor bird..... it is so sad to see her this way. I can see the canker in her throat, but it is no way near as bad as Jim's little baby. I am starting to think that there are other conditions affecting her as well. But keeping her nourished and alive right now is my first concern. 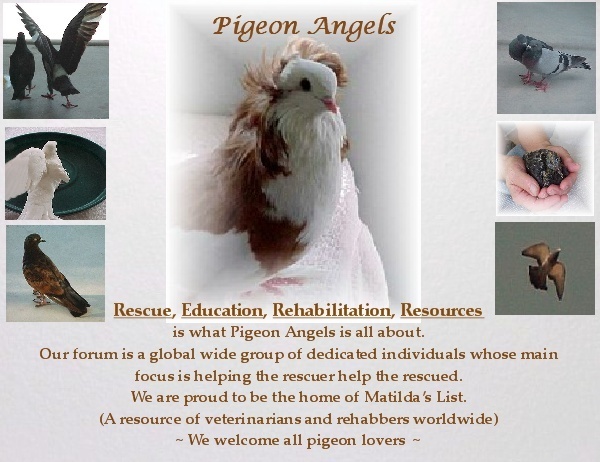 I will continue with the Flagyl and hand feeding, and first thing on Tuesday morning she will be going to Dr. Hauck. I just pray that I can keep her going until then. There probably is more going on with her than just the canker but getting that under control will make a huge difference. Louise I'm so glad you were able to catch this poor pigeon. I have no doubts that with you loving care this pij will get better, I just hope that what ever is the illness, besides the canker, she will be able to overcome it. Charis.....I am thnking salmonella and/or E-coli. Along with the possibility of worms. This is such severe emaciation. I would not consider treating her for worms at this point.......she is much to weak. Do you think I should add another antibotic........amoxicillin......to address other possible bacterial issues???? If so.....what is the dosage??? Do you know how much she weighs? No........I have no ability to weigh her........but, I would guess her weight to be in the 200g range. According to Karl Marx, DVM, this is the dose...50 mg per pigeon per day in divided doses or approximately 17 mg 3 times a day. Do you think cipro would be appropriate? I would just like to start addressing her other issues until I can get her to Dr. Hauck. Tuesday seems to be such a looooooong way off. I really think she needs injectible meds. It would but I don't have dosage instructions for cipro because I don't use it. Do you have previous instructions? Louise...acording to Dr. Weii...the cipro dosage is 25-50 mg per bird, once a day for 10 days for salmonella. This bird would be on the low side. I'm going to attempt to make the amoxicillin suspension with the applesauce as per your instructions. I'm a little afraid of the cipro as it is harsh on the digestive system. I don't want her to start vomiting.